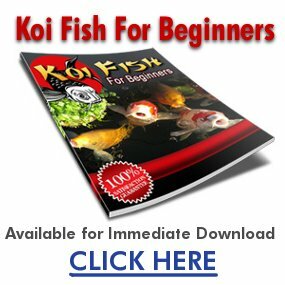 What types of fish can I mix in a koi pond? My girlfriend and I are looking to build a koi pond in our yard after we get our own place, so we’re planning all of this stuff out ahead of time, so everything goes over as smooth as possible. We’d like to know what kind of fish can be mixed with the koi, if any (we’d like variety), or if we can’t mix other types with koi, what other types of fish thrive well in a koi pond environment? I’m a fan of the bitterling because it looks like a goldfish but doesn’t poop as much. Goldfish are extremely ‘poopy’ fish; they require more filtration and more frequent cleanings than other fish. The bitterling looks just like a common goldfish but you don’t have to change the pond filter as often. The American Flagfish is nice, too, since it’ll eat your algae and is shiny. Avoid mosquito fish because they’re mean. They often pick on other fish and make your pond environment more stressful for koi. And goldfish mix well with koi. My Dad put a fantail goldfish in his koi pond and it grew to be very large. See if any of your local roofers are willing to donate an old roof lining to you. That stuff is excellent for ponds because it’s basically two inch thick waterproof rubber and makes a great lining. I got some for free from a roofer friend of mine and, since I dug my pond myself, the whole pond project was very inexpensive. You can make your own pond filter using a water pump, some tubing, a tall garbage can, and bags of pumice or lava rock or sponges. I like sponges the best. Anyway, ponds don’t have to be expensive. I dug mine, lined it with an old roof, built my own filter, and made my own pond railing bench out of two by fours so you can sit on the edge of the pond and look down in it. The whole experience was great and only took a weekend or two to accomplish. A hint for your pond: Build it in an area that receives shade for most of the day. I built mine in a mostly sun area and it wasn’t until I added some shade that I got my algae under control. Koi a pretty boring fish. Try something different than everyone else. like coloful native fish. There are many fish that might work. Goldfish are the fish that are most commonly mixed with koi and they do great. Other fish could be rosy red minnows( fat head minnows in there normal form), white cloud minnows( maybe depending on how cold it gets), wild fish( like bluegill, sunfish, bass, wild minnows and other fish), channel catfish( can either be caught or bought), mosquito fish, and Golden orfes. You can’t mix wild fish, like blue gill, bass, etc. with koi because they are predatory fish and will harass the koi and nibble thier fins off. They also carry bacteria and parasites that are harmful to koi. Koi do best by themselves. There are so many different kinds and colors of koi, that will give you the variety and contrast you are looking for. My research has shown that the majority of Koi ponds are kept pure since there are so many types and colors in the Koi family. The Koi fish alone can add an endless variety of color and style to any pond. Some people will mix a few common carp, grass carp or sturgeons into their Koi ponds. Goldfish and Golden orfes are also used in Koi ponds as well as minnows. For added pond variety some pond owners suggest the addition of a few snails while other Koi sites suggest the addition of turtles (or terrapins), frogs or toads. Whatever you decide, I wish you great success with your Koi pond.